The idyllic island of Boracay has surged in popularity over recent years, and when you see its white beaches, blue skies and crystal clear waters it’s easy to see why. Just 7km long, and 500m wide at its slimmest point, Boracay is a tiny stretch of paradise, outlined by shimmering stretches of immaculate, champagne-coloured beaches. Whether you want picture-perfect beaches, indulgent food, or the infectious excitement of a dynamic nightlife, Boracay has a lot to offer to the visitors that flock to its shores. Boracay also has the unique ability to offer an escape to tranquillity in the midst of all this fun. In just 20 minutes, you can escape to smaller, unspoilt beaches all around the island, sample local foods, and discover where island locals go to relax. 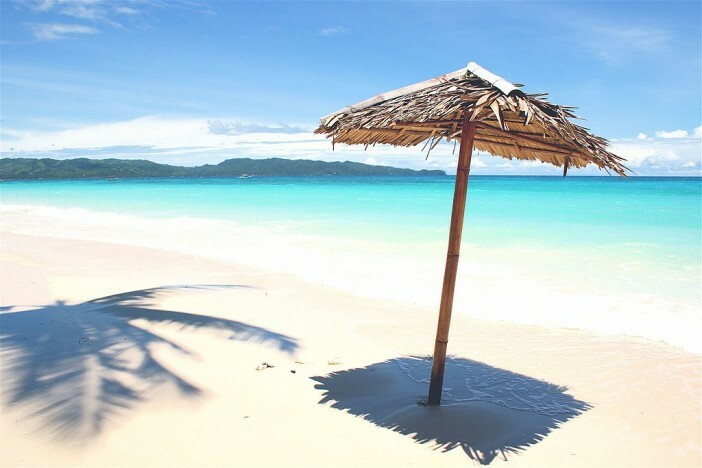 White beach is the epicentre of Boracay, and at four kilometres long it is large enough for its three stations to have their own individual personalities. Station one is where the majority of the large, luxurious resorts are situated and this can be felt on its wide, relatively quiet, beach. Station two is the centre of the beach, home to large numbers of midrange hotels and the island’s famous nightlife, it is often buzzing with people and excitement. Station three offers a little more tranquillity, with many of the hotels here playing host to backpackers and adventurers on a budget. White Beach is one of Boracay’s must-visit locations, offering spectacular panoramic views and a huge array of activities for all ages. Just a 20-minute ride from White Beach on one of the island’s tricycles-for-hire, Puka Beach is a popular location for people to escape the bustle of the Boracay centre. Still majestically beautiful, it offers a more peaceful retreat than the popular White Beach, especially in the mornings when you can often be the only person on the sands. Wooden beach huts are located near the cliffs at the back of the beach, and are available for visitors to relax in. After the spectacular sunsets that can be witnessed across the island, Boracay comes alive, with many tourists and locals heading out to make the most of bars and clubs. Even if partying until the early hours is not your thing, the restaurants that line the beach are perfect for enjoying a quiet night and marvelling at the fire dancers, and other performers that come out after dark. With so many beautiful beaches on offer, it’s difficult to decide which ones to visit during your stay in Boracay. If you’re struggling to make up your mind, take advantage of one of Boracay’s most popular activities – island hopping! You can hire a boat for a half-day tour, stopping off at beaches all around the island. These tours often include lunch, and who could say no to eating delicious local food on the crystal clear waters of Boracay? The waters around Boracay host a spectacular array of marine life, and the best way to see it is to take advantage of the diving courses (and rental shop for PADI-certified divers) that are available on the island. Large coral reefs, and all the wildlife within, can be seen in the deeper parts of the Boracay ocean, with expert instructors making sure you get the best possible up-close encounters. Water sports are popular on the beaches of Boracay, and visitors can try everything from sailing to water skiing. Marine walking, where you walk on the seabed with a 30kg helmet weighing you down, is a great way to experience the world beneath the ocean, especially if you are nervous about diving. As well as the usual parasailing and wakeboarding, paraw sailing is extremely popular in Boracay, and is a great way to enjoy the spectacular sunsets on White Beach. If you have a taste for seafood, a trip to the D’Talipapa seafood market must not be missed. Browse the stalls and choose fresh seafood or meat at a fraction of the price that it would cost in a beach-front restaurant. Then, take it to one of the market’s restaurants to have it cooked exactly as you like. As you only pay the cooking fee, based on weight, this is the perfect way to sample the amazing seafood on offer in Boracay at a bargain price. Many Filipinos adore Spanish food, and Dos Mestizos is renowned for its delicious, no-frills Spanish dishes. You can choose from a wide range of tapas, seafood, paella, and other classic dishes, best paired with a jug of sangria. Attached to the restaurant is Gusto Y Gustos, a deli that belongs to the restaurant and makes the most delicious gourmet sandwiches, perfect for a day at the beach. Street food is part of the local culture in Boracay, and it’s a must to sample the plethora of delicious street fare on offer along the beachfront. For those with a taste for adventure, balut (boiled, fertilised duck egg) and adidas BBQ (chicken feet on a stick) are popular among the locals. If you are in search of something a little more familiar, vendors also sell corn-on-the-cob, Pork BBQ, and a whole range of other treats. They also sell the island’s famous chori burger, which is grilled chorizo meat in a sweet and spicy sauce, served in a bun. If the paradise island of Boracay has piqued your interest in a Philippines cruise break, why not browse our full collection of cruises to Southeast Asia? With amazing prices on a wide range of cruises, you can afford to start planning your dream trip to the Philippines. For more information, call our team on 1300 857 345. Images sourced via wikipedia commons and Flickr creative commons. Credit: Angelo Juan Ramos and David Stanley.